Nothing too fancy here. Trying to create a sense of "land waves" receding to the horizon (and work on my cloud techniques). 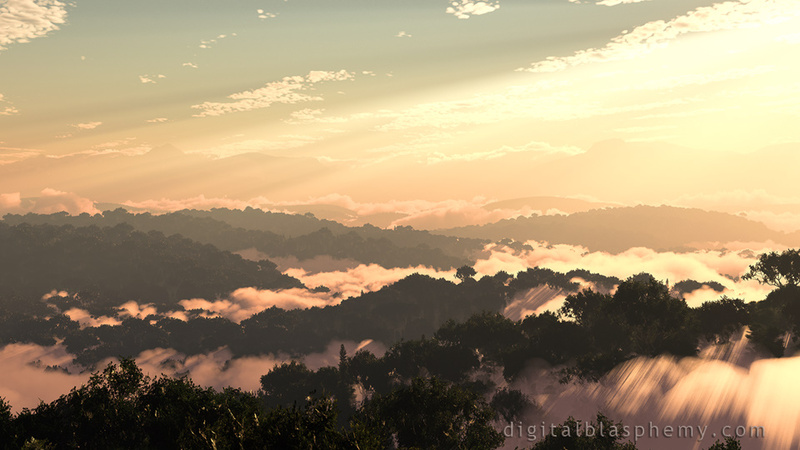 Also wanted to do a Vue landscape that could render in under 12 hours at 6K :-) Hope you enjoy it! What happens if you try the 3840 x 2160 image? Does it not scale to fit your screen vertically? Could you please make this version available on larger resolutions, for my S8 phone please! Reminds me of the Blue Ridge mountains in North Carolina. This image is a peaceful as the real thing. Just wondering how difficult it would be to make a winter render of this? Which is kind of odd for me, as usually I can't wait for winter to be over... Ooh, and maybe a night version of that as well. I like the daytime view over the blue sky variant, that magical golden light is what wins me over. "One of your best pickles"
I love this version, and actually prefer it to the ochre-toned original. Blues and greens are my favorite backgrounds of yours and this one is really nice and peaceful. I actually like the pickle jar version with the blue sky best. I reminds me of the view from the light airplane as I flew over the foot hills of the Oregon Coast range. "Streaks are a good thing"
Actually I like the streaks in the clouds. Walking in the Michigan forests and looking west over Lake Michigan (when the world was less politically correct); we'd call those "God rays". This is so right, it captures reality as I have seen it many times. The clouds are really the best part, spot on. My only thought is a color related one, it could be a little more colorful...but I nitpick. Some night and moonlight scenes would be nice pickle jar versions. 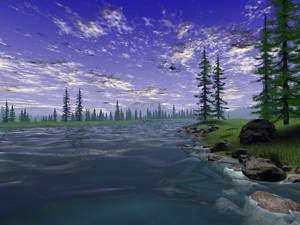 Very nice picture, reminds me of Northern California. Only problem is the streaking in the bottom right. The light rays through the trees don't look quite natural. Very very very nice - 10/10 with me. It is like a cross between Heliocentric and Shanshui. "The word that comes to mind is 'Majestic'..."
The dawn of a new day, when the land is being first touched by a bright, golden sun. Really nice, Ryan!! Thanks!! "Nice, Needs a night version"
I really like the rolling hills. I'd love a night version as I prefer darker wallpapers. 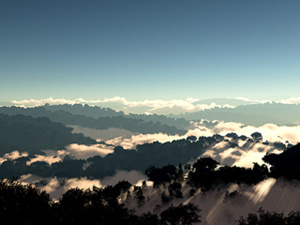 Now this is what I absolutely love about your renders your nature scapes are always so fabulous. It's exactly why I have a lifetime membership. Absolutely stunning!!! Ryan, I've been following your work for over 15 years, now. This is one of your best. It's beautiful & peaceful. I love it! I love it! I'm very impressed with how realistic the whole scene is. Also - congratulations on the 20th anniversary! Here's to 20 more!! !